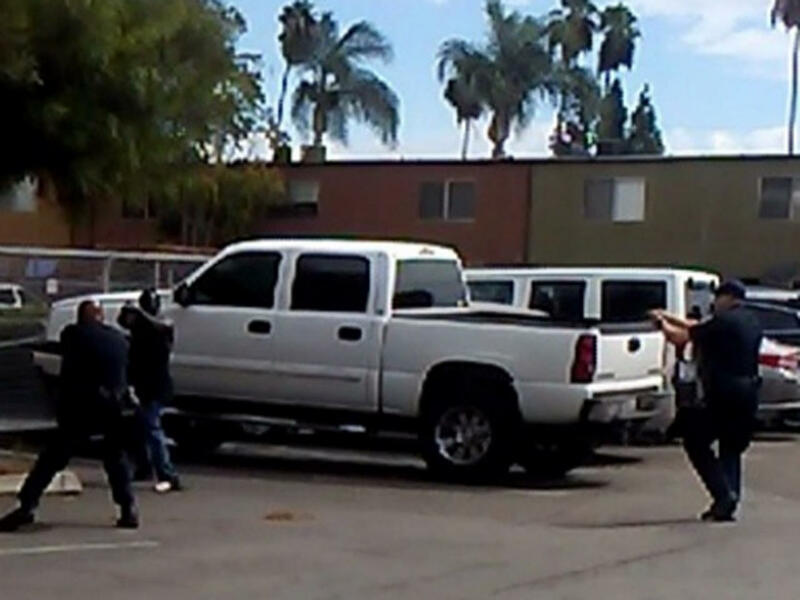 EL CAJON, Calif. -- Police shot a man they said was acting erratically in a San Diego suburb Tuesday, drawing an angry cluster of protesters who believed it was another instance of law enforcement shooting an unarmed black man. The man died at a hospital. Several dozen people, most of them black, gathered and some cursed at officers guarding the scene in El Cajon after the shooting. The protesters later went to police headquarters, reports CBS San Diego affiliate KFMB-TV. The protest was angry but peaceful. The fatal shooting comes soon after black men were kshot and killed by police in Tulsa, Oklahoma, where peaceful protests developed, and in Charlotte, North Carolina, where violent protests broke out. A woman who was working the drive-thru window at a restaurant next to the shooting captured it on video. The woman turned her phone over to investigators voluntarily and signed a consent form, police Lt. Rob Ransweiler said. Police said the man did not have his hands up when he was shot, as some witnesses have said, and police said the cellphone video shows it. Officers were called to the area of the Broadway Village Shopping Center shortly after 2 p.m. by reports of a man acting erratically, “walking in traffic, that kind of stuff,” Ransweiler said. At that point, the statement said, one officer with a Taser-like device “discharged his weapon” and, at the same time, an officer with a gun fired several shots, hitting the man. He was taken to a hospital, where he died, police said. He was believed to be in his 30s. At a news conference, El Cajon Police Chief Jeff Davis appealed for calm and promised a thorough, transparent multi-agency investigation, KFMB reported. He didn’t disclose what the object was that the man had but said no firearm was recovered. Bystanders reported hearing about five shots, the station said. Davis said both officers would be put on administrative leave for at least three days, standard procedure for such incidents. Both have more than 20 years on the force, he said. Michael Ray Rodriguez was among the witnesses who said the man had his hands in the air. He said he was driving out of his apartment complex past the shooting scene and saw a shirtless black man with his hands up and an officer firing seconds later. Several witnesses alleged the officers were unduly quick to open fire and suggested that their actions had been influenced by the fact that they were dealing with a black man, one they described as mentally challenged, KFMB said. One man angrily told reporters the victim was suffering a seizure prior to the shooting. One woman who appeared in a video posted by Rumbie Mubaiwa on her Facebook page is heard telling police at the scene that the man was ordered to take his hand out of his pocket. On Mubaiwa’s tape, a woman wearing hospital-style scrub clothing who said she was the man’s sister appeared distraught, repeatedly shrieking and crying, telling officers she had called them to help her brother. “Don’t you guys have crisis communications teams to talk to somebody mentally sick?” she asks. A new policy by the San Diego County District Attorney’s office requires release of such officer-involved shooting footage, but it was unclear when that would happen, Ransweiler said. The police department is working on a program to have officers wear body cameras, but none have been issued, Ransweiler said. El Cajon is a city 15 miles northeast of San Diego and has a population of about 100,000. It is 69 percent white and 6 percent black, according to 2010 census figures. It has become a common home for refugees fleeing Iraq and, more recently, Syria.